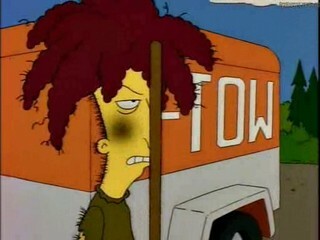 Sideshow Bob is released from prison and tries to kill Bart (the first time), prompting the family to relocate to a houseboat. Bart receives a series of threatening letters, which are revealed to be from an up-for-parole Sideshow Bob. Kelsey Grammar reprises his role as Sideshow Bob, making his third appearance on the show (after season 1's "Krusty Gets Busted" and season two's "Black Widower"), and the first in which his appearance didn't involve a mystery that needed to be solved. As the title suggests, this episode is a parody of the 1962 film Cape Fear and its 1991 remake (starring Nick Nolte and Robert De Niro), and elements of Bernard Hermann's score from the original film (which was also used in the remake) are used in the episode, which, moving forward, will become Sideshow Bob's musical theme. Though I gather it hit the overall beats of the films rather well, I've never seen either version, and its a testament to the quality of the episode that you really don't need to be familiar with the source of the parody to enjoy this episode. Per the DVD commentary, this episode was produced as part of season four and held over, the last such episode, which also makes it the last episode to be worked on by the show's original writers, many of whom left between seasons four and five. As a result, the episode contains several more cartoonish and slapstick-y bits that ordinarily wouldn't have been put into an episode, but the departing staff figured they had nothing to lose by including them. The writers also had a difficult time stretching the episode to the allotted running time, leading them to extend certain sequences to fill time, including the first act montage of people Bart thinks are trying to kill him and the famous rake sequence. In addition to Cape Fear, this episode references elements of the films' Psycho (Bob stays at the Bates Motel), Nightmare on Elm Street (Flanders' finger razors), Friday the 13th (Homer's hockey mask and chainsaw), The Night of the Hunter (Bob's hand tattoos) and, of course, the Gilbert & Sullivan operetta H.M.S Pinafore. For anyone who plays Tapped Out (the Simpsons world building mobile game), Moe's task to smuggle endangered species comes from this episode, as he's shown to be (randomly and hilariously) keeping pandas in his back room, which he sets free after Lisa calls, believing him to be behind the threatening letters, telling him the gig is up (and if you do play Tapped Out, feel free to friend me on the game. I'm austingorton (clever, I know)). This episode introduced the phrase "fatty-fat-fat-fat" (which is what the playground girls are calling Bart, according to Milhouse) to my lexicon, often used to describe either myself, or one of my cats (the fat one, natch). Marge: Lisa, you got a letter. Lisa: It's from my pen-pal Anya! Anya: [voice over] Dear Lisa, as I write this, I am very sad. Our president has been overthrown and [gruff voice of a man] replaced by the benevolent general Krull. All hail Krull and his glorious new regime! Sincerely, Little Girl. Bart: But who'd want to hurt me? I'm this century's Dennis the Menace. Blue Haired Lawyer: But what about that tattoo on your chest? Doesn't it say, "Die Bart, Die?" 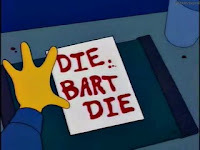 Bob: No, that's German, for "The Bart, the." Parole Officer: No one who speaks German could be an evil man. Parole granted! FBI Agent: Er, no, Screamville. Homer: Hey kids, wanna drive through that cactus patch? Sideshow Bob: [from under the car] No! Homer: Well, two against one! This episode is one of a handful that enters into consideration for the title of my favorite Simpsons episode of all time. It's certainly my favorite of a handful of superior Sideshow Bob episodes, and the famous rake sequence, in which Sideshow Bob emerges from beneath the Simpsons' car only to be whacked in the face by a seemingly never ending series of rakes (he's actually whacked nine times in the original non syndicated version), still stands as the piece of comedy which has elicited the loudest, longest laugh ever from me when I first watched it (it was also one of my first encounters with what I now know is endurance humor). While this episode lacks that little spark of heart that is found in many of the best Simpsons episodes, and is more concerned with straight-up parody than any satirical elements, it is filled wall-to-wall with laughs, even beyond the rake sequence: Homer's inability to learn his new alias ("I think he's talking to you"), Sideshow Bob's repeated Looney Tunes-esque injuries (Homer dumping his hot coffee on him, driving through the cactus field, the rakes, the parade (another example of endurance humor)), Bart stalling for time for by having Bob perform the entire score to H.M.S Pinafore ("a plan fiendishly clever in its intricacies"), before the Simpsons' houseboat runs aground near a brothel (where all the cops conveniently are). This may not be the series' best episode (then again, it may be), but its certainly one of its funniest, and a perfect example of a show at the top of its game. The pinnacle of Sideshow Bob episodes (which is a fairly tall peak) and one which is always in the discussion of "best episodes ever". For me, the best Bob episodes are either this or the Bob and Cecil ep. from season... 8? "Oh, Cousin Merle REALLY?" It's honestly kind of a bizarre film to reference, being both recent (1991), and full of stuff that would never make it into a cartoon show. It does hit a few iconic images, but it doesn't really try to go beyond that (which is a good thing- we didn't really need jokes about SLH getting poisoned). It's also very much the 1991 version, from the back tattoos to the Hawaiian shirt in the movie theater. In a way, it's a shame that it kind of closed the door on a Night of the Hunter parody, which is about crazy Mitchum stalking a pair of young kids. Then again, get ready for "Night of the D'oh-Hunter," the deer hunter/night of the hunter parody you've been waiting for in season 27 or so. On the one hand, this episode represents everything I started disliking about the show in a few years. It's full of stuff that would be run into the ground by the Simpsons and just about every other animated sitcom. But it gets away with it because it's still really funny throughout. I also think you really have to "earn" episodes like this as a show. If we don't know the family's characters and see them as real people, this kind of thing doesn't work on the same level, it's just a bunch of "lol, that was so random" bits. The show really started losing me as a viewer when every episode escalated to this level of goofiness without much of any character. Agent [to Homer]: Tell you what, sir. From now on, you'll be, uh, Homer Thompson at Terror Lake. Let's just practice a bit, hmm? When I say,"Hello, Mr. Thompson," you'll say, "Hi." Agent: Remember now, your name is Homer Thompson. Agent: (sighs in frustration) Now, when I say, "Hello, Mr. Thompson," and press down on your foot, you smile and nod. 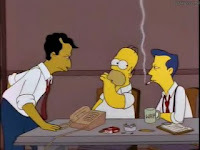 Homer: (stares blankly; to other agent) I think he's talking to you. What a giggle-fest! I love love love this episode! And in tribute to its greatness, my husband and I, when discussing a shed full of tools, no longer say “garden rake”. It’s a “Sideshow Bob rake”. The fact that cartoon characters and comic actors have been repeating this gag endlessly since the invention of motion pictures just goes to show how completely Mr. Terwilliger OWNED this bit! @Dobson: For me, the best Bob episodes are either this or the Bob and Cecil ep. from season... 8? Yeah, that was season eight. And I agree, it's one of the best Bob episodes ("Coveralls that don't quite cover all! "), along with this one. 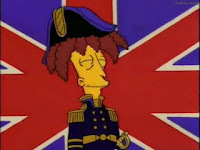 I'd probably also include "Sideshow Bob Roberts" from the sixth season, though that one really stands out for being such a scathing political satire that Bob almost gets overshadowed. I adore that whole extended sequence. Just wonderfully constructed from start to finish. @Marebabe: my husband and I, when discussing a shed full of tools, no longer say “garden rake”. It’s a “Sideshow Bob rake”. If I ever got around to settling on my own personal top five Simpsons episodes, I can't imagine this one not making the cut. The rake scene in particular is simply wonderful. It's so brilliantly simple a concept: rule of three the rule of three! That said, Dobson's points are well taken. Someone once said that the problem with later seasons was that the show started to use surrealism and randomness as an alternative to comedy, rather than as a source of comedy, and I think that's about right. @SpaceSquid:Someone once said that the problem with later seasons was that the show started to use surrealism and randomness as an alternative to comedy, rather than as a source of comedy, and I think that's about right. I like that observation; it does indeed seem apt. That said, were we to lose episodes like this, then not only would we be the poorer for it, it's just as likely the show would have started to become overly reliant on something else. Agreed on both points. A little absurdism/randomness can be quite funny, but like anything else, overuse will take away the impact.